Did Keith Fancher and his crew set the bar so high last alligator season that it may be some time before one larger than the 838-pounder is caught? It depends on whom you ask. James “Big Daddy” Lawler, host of the “Gettin’ Outdoors” radio show on WJDB each Saturday morning, helped unveil the full-body mount of the Fancher gator at the Gee’s Bend Ferry Building in Camden recently. Lawler said the Fancher gator, which was measured at 14 feet, 2 inches the night it was caught in Miller’s Ferry (Dannelly Reservoir) last August, might not be the biggest gator in west central Alabama. However, if you ask Keith Gauldin, alligator hunt coordinator with the Alabama Wildlife and Freshwater Fisheries Division (WFF), the Fancher gator may be the standard for a long time. “I’ll be real surprised if there’s one larger than that harvested,” Gauldin said. “That is a large alligator for Alabama; not just Alabama, but for the species. They just don’t get much larger than that. When Fancher and his crew hooked the big gator, they had no idea what was in store that night or in the aftermath of weighing in the monster. J.C. Peeples was the first of the crew to get a hook in the gator with a weighted treble hook. Peeples was fortunate that the hook stuck into the softer hide right under the gator’s jaw and had to be cut out at the weigh station. But the gator wasn’t quite finished. “I was glad we were on a pontoon when he did that,” J.C. said. Once the gator was dispatched beside their boat, they realized there was no way to get the behemoth onto the pontoon boat, so they tied it to a pontoon and idled several hours back to the check station. The gator then had to be loaded onto the boat trailer to get it to the scales at about 3 a.m. The mounted gator will be on display in Camden for 30 days and then make several stops around the state. “The Wilcox Area Chamber of Commerce works outside the box when it comes to promoting the outdoors activities we have,” Lawler said. “They have the vision to know what this gator is going to do for the county for the next 30 days. It’s going to bring so many people in here. We even had unexpected guests to come look at the gator. Ray Scott and Pam Swanner of Black Belt Outdoors Adventures showed up to see the gator. The 2012 alligator seasons are already set, and registration will begin online at www.outdooralabama.com at 8 a.m. on June 5. Registration ends at 8 a.m. July 13. There is a $6 per application fee. Interested parties can submit as many applications as wanted. Gauldin said the large gators that have been brought to the scales in recent years may have affected the harvest numbers last year, when only 78 of the 125 tags were filled in the Delta. “The first seasons we had it seemed people were just happy to get an alligator,” Gauldin said. 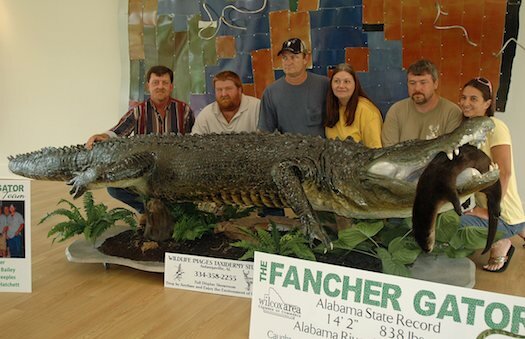 “But when you have stories like the Fancher story with that large gator, more and more people want to ‘trophy’ hunt. Instead of just going after that legal gator of 6 feet or longer, they’re going after a large gator. They tend to let several animals go that are not large enough for them, and they end up not getting anything. The clock runs out, basically. Gauldin also expects the hunting around Miller’s Ferry will be tougher this season. “With the west central zone being new last year, those gators hadn’t been under any pressure,” he said. “I think you’ll see, like you see in the Mobile-Tensaw Delta or Eufaula area, a decrease in the number of large individuals. I don’t think it’s necessarily a decrease in the population; I just think the animals are more wary. The seasons for the Mobile-Tensaw Delta and the west central Alabama counties of Wilcox, Dallas and Monroe north of Highway 84 are Aug. 16-18 and Aug. 23-25. The season in southeast Alabama is Aug. 10-26. There will be 125 tags available in the Delta, 50 in west central Alabama and 120 in southeast Alabama. Applicants who are drawn are required to attend a mandatory training class before they are issued an alligator harvest permit.